You and I may have a word-choice problem, but our word-choice problem does not have to have us! We are children of God who are filled with His righteousness. It is time for a new day with words, girlfriend. Chin up. Shoulders back. Deep breath. Intentional step forward. Let’s do this. Read Proverbs 18:21. What two powers does the tongue posses? Which of those do you want your words to reflect? What can you do today to make that happen? 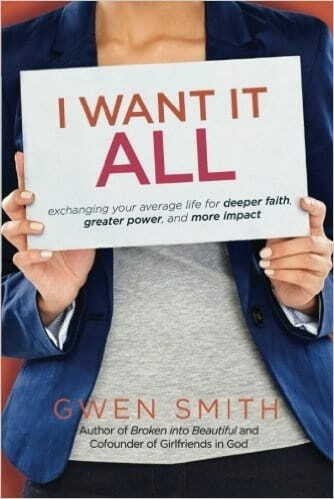 Today’s post is an excerpt from Gwen Smith’s new book, I WANT IT ALL, whichgives you practical help that will connect your struggles to the solutions and strength of God found in the Bible. Order yours today from Amazon, Barnes & Noble, ChristianBook.com or your favorite retailer. For a signed copy, get yours from the store on Gwen’s website! Stay up with Gwen on her blog, and connect with her on Facebook| Twitter| Instagram| Pinterest.